You can choose from seven room types, including condominium-style rooms and classic hotel rooms to meet the needs of those on business trips as well as vacation. 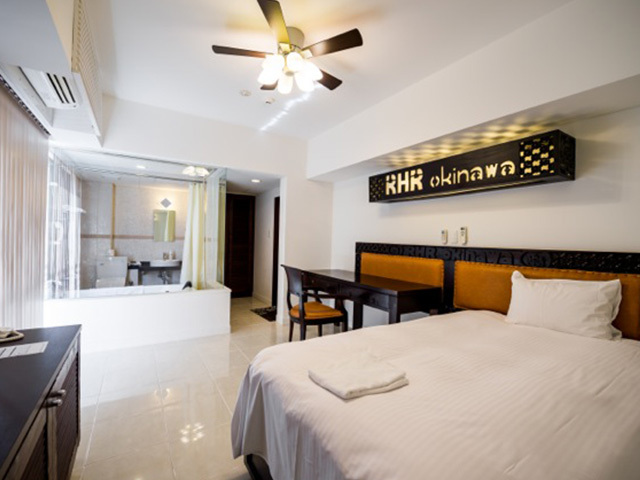 Located in front of the gate at Torii Station (Yomitan Communication Station) and designed to meet the various needs of guests, Royal Hotel offers hotel rooms (South Hill) as well as condominiums (North Hill). Perfect for vacations and extended stays. Guests are sure to be satisfied with the hospitality-minded services. 20-minute drive from Okinawa South exit of Okinawa Expressway. Take bus No. 28 from Naha Bus Terminal and get off at Akainkogu stop. The hotel is in front of the bus stop. Parking available for 40 vehicles (including 2 accessible parking spaces). Free Lion Coffee available during your stay!